Rebecca Fisk needed the ACLU’s aid to start a gay-straight alliance club at the school. 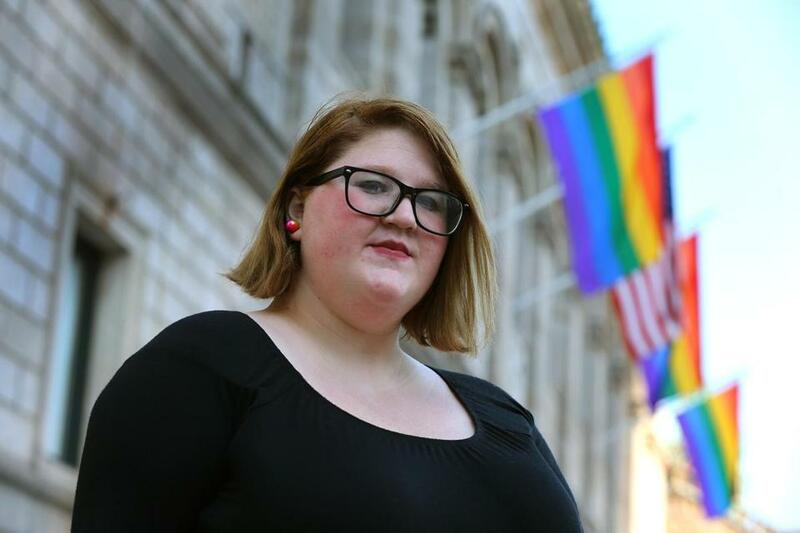 Rebecca Fisk, who graduated last year from Mystic Valley Regional Charter School, implored administrators for months to let her start a gay-straight alliance club. It happened — only after the American Civil Liberties Union stepped in on her behalf. Lucas Donohue, a former sixth-grade teacher at the Malden charter school, said in his three years there, he never witnessed immigrant students receiving the specialized training they needed to master English. At least six became so discouraged they left, he said. Mystic Valley — one of the state’s biggest charter schools, with 1,500 students — touts its high test scores and disciplined academic climate. But the school has repeatedly drawn the attention of state regulators. In 2015, state officials blocked Mystic Valley, where more than 40 percent of students are black, Hispanic, or Asian, from expanding enrollment because it lacked appropriate services for students who don’t speak English. Regulators have also repeatedly criticized the board of trustees for being overly involved in day-to-day management of the school, for not being accessible to parents, and for “opaque” dealings that have violated the state’s Open Meeting Law. More recently, the school, headquartered in a warren of brick buildings sprawled across a city block, attracted national attention because of a battle over its dress code. Critics contended a prohibition on styles that include hair extensions discriminated against students of color. The school’s trustees, who defend the policy as one that fosters a culture emphasizing education rather than style, have vowed to address the issue over the summer. “The more we look at the school, the hair problems appear to be the tip of the iceberg about issues of discrimination,” said Sarah Wunsch, deputy legal director for the American Civil Liberties Union Foundation of Massachusetts. The ACLU is one of several groups representing twin sisters who recently faced repeated discipline for wearing braided hair extensions. Kinnon declined repeated requests for an interview, most recently at a June 12 trustees meeting, where he told a Globe reporter he had “no interest” in speaking. Alexander Dan, Mystic’s interim school director, also declined an interview at that time but responded to questions from the Globe with written statements. Dan defended the school’s track record, pointing to state data that indicate black students at Mystic Valley typically outperform their peers from surrounding communities on state and college entrance exams. He contends the school is serving the needs of students who are disabled, have extra needs, or are low-income. He cited state data, known as attrition rates, that track the percentage of such students who leave during a small window of time — between the end of one school year and the start of the next. Those data show student attrition from Mystic, averaged over the past five years, is lower than the numbers from six nearby communities. “This statistic is often used to judge satisfaction among students and families within a district, particularly a school/district of choice from which students could withdraw at any point,” Dan said. 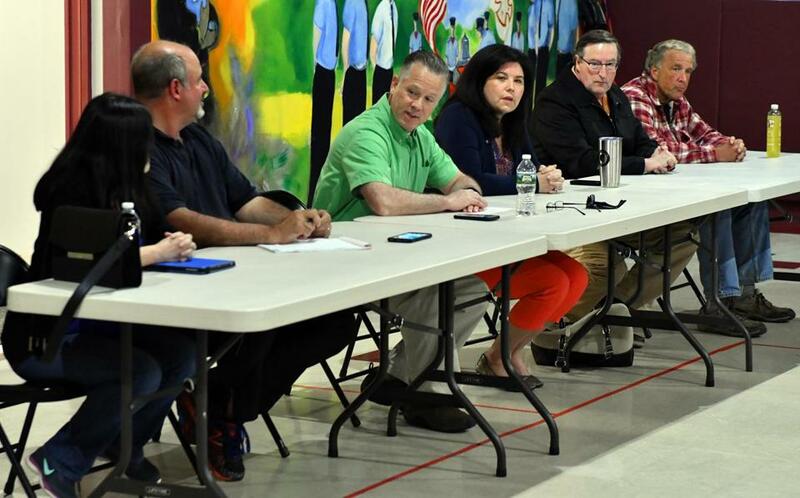 Members of the Mystic Valley Regional Charter School Board met in May. But another barometer that measures satisfaction — the percentage of students who stick with Mystic Valley throughout the school year — suggests a different picture. By that measure, known as stability rates, Mystic Valley ranks near the bottom for students who are disabled, have extra needs, or are low-income, compared to schools in those six nearby communities, according to a Globe analysis of the data. The state data also show that Mystic Valley, which accepts students by a lottery system, reported enrolling few with limited English abilities. Fewer than 2 percent of its students are identified as English language learners. Yet in the two school districts from which Mystic Valley draws more than half of its students — Malden and Everett — English-language learners account for about 17 percent of the population. Charter schools are public institutions, but most, including Mystic, operate independently of local systems. Donohue, the former sixth-grade teacher at Mystic, said he watched students with limited English skills walk away because the school did not provide the training they needed to improve. Donohue left in frustration in 2011 for another charter school and now teaches in the public school system. While at Mystic, Donohue said, he saw some students with limited English skills repeatedly held back a grade. But other students, with equal or worse grades, were allowed to move on because they had higher MCAS scores, he said. “I had a student who was 16 in sixth grade. He was Haitian, his family spoke no English, and he was in sixth grade for the third time,” Donohue said. Dan, Mystic Valley’s interim school director, declined comment on Donohue’s assertions. But he said in a statement the school has beefed up its process for recruiting and retaining students with limited English skills. He also noted that state regulators, who blocked Mystic Valley’s request to expand enrollment for four years, relented last year after Mystic agreed to a number of changes, including a vow to improve services for English learners. Fisk, the student who urged Mystic Valley to allow a gay-straight alliance club, said she and other lesbian, gay, bisexual, and transgender students felt marginalized. Still, she said, Dan asked her to prepare a written proposal, which she submitted days later. She heard nothing from the school for months. Then in October 2014, Fisk said she was informed there was no money for new student clubs. That’s when she requested help from the ACLU. Dan declined to comment on Fisk’s assertions but said in a statement that at least two other student clubs were proposed at the same time. “The [trustees] determined that the school needed to create a policy to ensure fairness in assessing demand for clubs and in order to continue to operate in a financially responsible manner . . . with proper faculty supervision, with adequate compensation for faculty advisers, and with adequate student participation,” Dan said. 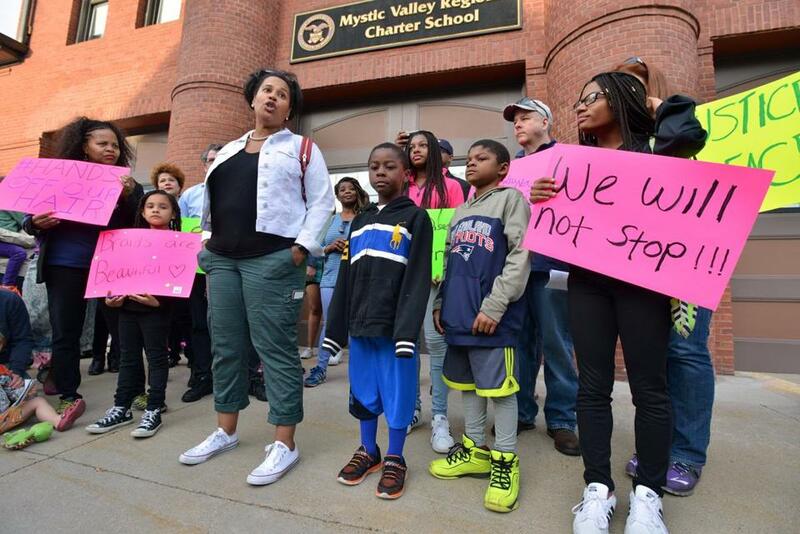 Tanisha Sullivan (center), president of the Boston NAACP, spoke during a rally outside the school in May. Mystic Valley approved Fisk’s proposal nearly a year after she submitted it, and a gay-straight alliance launched in fall 2015, in time for Fisk’s last year at the school. Civil rights groups say the recent spotlight on Mystic Valley for its hair and dress code raised troubling questions about the school’s policy for disciplining students. More than a dozen current and former students, teachers, and parents told the Globe that black and biracial students were more frequently punished, particularly for violating the dress code, compared to other students. Yet some parents contend that is not true. They say their children, who are white, have also faced discipline for breaking the rules. Leanne Bello, who has three daughters at Mystic Valley, said she received notices from administrators when one of her daughters wore a headband, and then a small hair piece, that did not conform to the dress code. The note warned that her daughter would face detention if she violated the rules again. The Globe and the Lawyers’ Committee for Civil Rights and Economic Justice each filed requests for public records from Mystic Valley to assess the impact of the school’s dress code on students of color. But Dan said in a statement he was unable to furnish those discipline records, broken down by race and gender, because a $15,000 computer system installed in the 2013-2014 school year to track students is not capable of producing such data. Dan said the school would need to hire a consultant who could reconfigure the computer system to produce the report. But some Mystic graduates say the disparity in discipline has gone on for years. Shaynice Dorcena, who graduated in 2010, said she received a stellar education but faced detentions for her hair extensions even while white students who clearly dyed their hair, from blond to jet black, did not. The dress code prohibits hair dye. “I love Mystic Valley, and I enjoyed my time there,” Dorcena said. She is saddened by the recent avalanche of negative publicity the school has received about its dress code because, she said, teachers and administrators treated her with respect. But the school’s legacy of discipline for students of color still troubles her.